A number of factors combined recently leading to the creation of these hot! hot! hot! 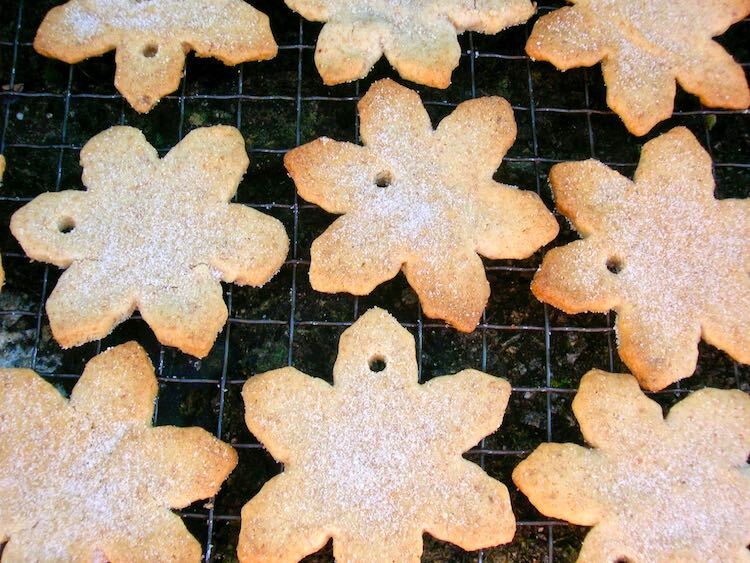 chilli shortbread biscuits. I can only describe these as a chilli lovers delight. Hang them on the tree or pack them up into a pretty box, tin or bag as a gift for those that like a bit of spice in their life.. Either way, they’re bound to make a Christmas talking point. First off, this month’s We Should Cocoa theme is “cookies”. I’d already bookmarked a recipe in Miranda Gore Browne’s book Biscuit for ‘passionate chocolate hearts’, which is basically white chocolate shortbread with a passionfruit filling. I decided to omit that filling as I wanted to create one using our last remaining persimmon. In the end, however, I realised I had some leftover orange & white chocolate buttercream from my mother in law’s birthday cake. It was sitting in the fridge and in need of using up. Secondly, I’d recently been sent some Christmas cutters to try out, courtesy of Eddingtons, a supplier of all things kitchen. The cutters were all stainless steel and consisted of one set of three snowflake cutters and a set of three angel cutters in various sizes. The Angel cutters came as a kit with red ribbon and a pin to make the all important holes for threading the ribbon. Lastly, the jewel in the crown: half a bar of Dartmoor Dragon. This is a powerful white chocolate bar containing Naga chilli from the Dartmoor Chilli Farm. Too hot to eat on its own, at least for CT and I, it makes an excellent addition to baked goods; I found this out when I used it in the pastry for the persimmon tarts I made a couple of weeks ago. It packs a powerful punch, even when diluted by flour, butter and sugar. As I think I may have mentioned, there was no mistaking the kick in these chilli shortbread biscuits. Luckily, they’re also truly delicious. Shortbread is probably our favourite type of biscuit and these didn’t disappoint. They were crisp on the outside and slightly chewy in the middle with a nice rich buttery flavour. The angels sandwiched with buttercream, were slightly less hot and had the additional orange flavour for the full Christmas effect. I’ve never made hanging biscuits before and surprised myself with how effective they looked. Will they last until Christmas? No comment. These biscuits are a sort of three in one or mix and match recipe. You can either make hanging decorations, cookies as gifts or biscuits sandwiched with orange buttercream. Or you can make all three. Perfect for Christmas, or just make different shapes for any other time of the year. Soften the chocolate by putting it in the mixing bowl and placing it on a heater for ten minutes or over a pan of hot water. Add the butter cubed and leave for a couple of minutes to soften, but not melt. Cream the butter and chocolate with the sugar until pale in colour and fluffy in texture. Stir until everything is incorporated, then form into a ball with your hands and leave in a cold place to firm up for half an hour. Roll out on a floured board to about 3mm thickness. Stamp out shapes using whatever cutters grab your fancy. I made 12 largish snowflakes and 18 slightly smaller angels. Leave to firm up in a cold place for 15 minutes, then pop into a pre-heated oven (180°C) and bake for 10 minutes. For hanging decorations, make a whole in the top of each snowflake whilst they are still hot, by pushing in a narrow skewer or similar metal implement. Dust all of the snowflakes with sugar and half of the angels, (if making) then transfer to a wire rack to cool and harden. 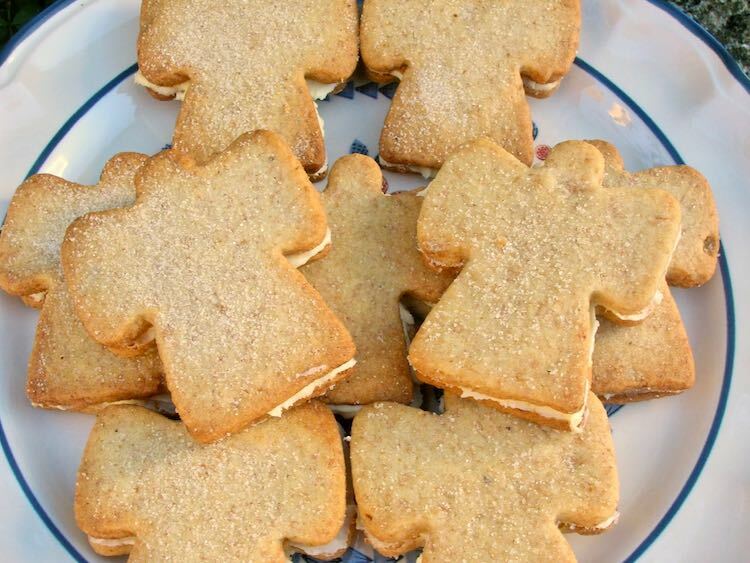 Sandwich the angels with orange buttercream, using the plain ones as a bottom and the sugared ones as a top. If you can’t get hold of white chilli chocolate, just add ½ tsp hot chilli powder such as cayenne to the flour. We Should Cocoa is being hosted this month by Rebecca of BakeNQuilt who has chosen cookies (or biscuits). So if you haven’t done so already, you still have three days left to get your entries in for any type of biscuit that includes some sort of chocolate. 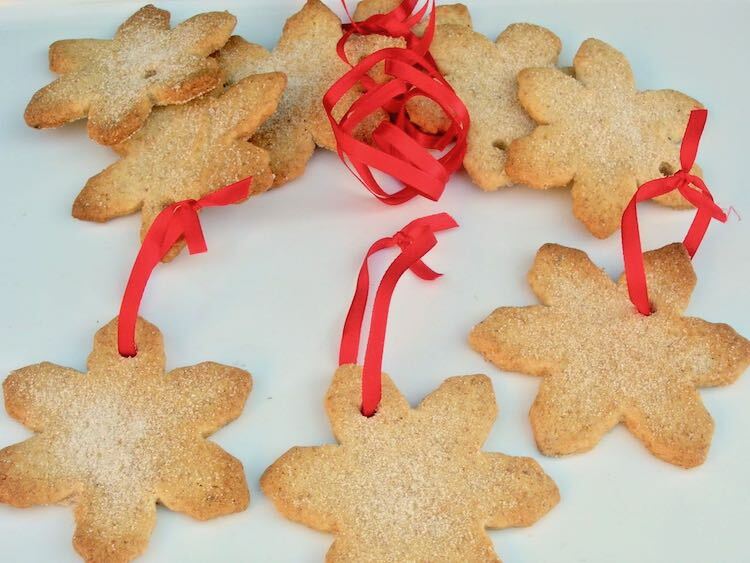 These chilli shortbreads also fit very nicely with the festive theme of this month’s The Biscuit Barrel with Laura of I’d Much Rather Bake Than …, so a few of those are winging their way in that direction. As the base recipe I used for this was bookmarked from Miranda Gore Brown’s book Biscuit, I am submitting this to Bookmarked Recipes with Jac of Tinned Tomatoes. Using local produce where possible is something I have always tried to do and usually manage to include local eggs, flour or milk in my bakes. This time in addition to Cotehele flour, I have used some chocolate bought from the Dartmoor Chilli Farm at a farmer’s market in Plymouth. So, I am entering Shop Local over at Elizabeth’s Kitchen Diary. Brit Mums are doing a round-up of all things Christmassy for December, so I am sending these Christmas Snowflakes off to that too. Thanks for visiting Tin and Thyme. If you make these chilli shortbread biscuits, I’d love to hear about it in the comments below or via social media. Do share photos on social media too and use the hashtag #tinandthyme, so I can spot them. For more delicious and nutritious recipes, follow me on Twitter, Facebook, Instagram or Pinterest. Chilli Shortbread Biscuits. PIN IT. Thanks to Eddingtons for sending me the cooking cutters. Their products are widely available online and in cook shops and department stores. I like the snowflake cutter set. It’s great for making Christmas biscuits. Thanks Dan, they are useful indeed and pretty too. Those snowflake biscuits are just beautiful and festive! Thank you Angie – they got me into the party spirit nicely. Well, this looks like a very good use for my snowflake cutters! Beautiful cookies. I’d like to be around when some unsuspecting soul tries to pinch an ornament off your tree and is surprised by the heat! These look beautiful. I’ve never made hanging biscuits either but this year I’m trying to persuade my mum to give all sorts of things a go for Christmas so we will wait and see! I’m ever so glad you shared them with the Biscuit Barrel challenge! Thanks Laura. Do give them a go, they look rather splendid. I’m going to try and make some more nearer the time for my mother’s tree. Thank you lovely Dom. I must say I am very pleased with these. Both snowflakes and angels are delicious and I’m pleased to say my biscuit tin still feels heavy. You could not have chosen a biscuit more suited to my tastes than these. I love good white chocolate and know the south Devon chilli farm well so this is certainly a recipe I will be baking over Christmas and I will make your chocolate mincemeat, taking it to one of my classes to see what the students think! What pretty snowflake cutters! So adorable. Love the flavouring of these biscuits too, chocolate chilli, yum! 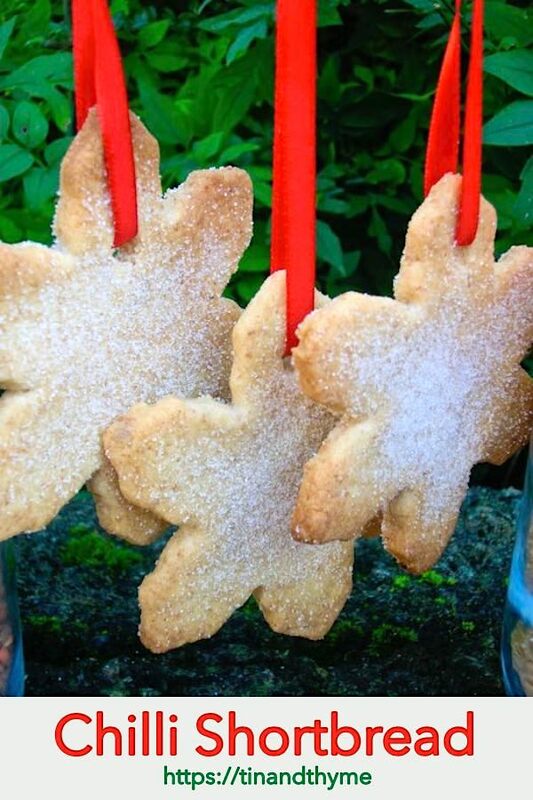 I love those snowflake cutters, can think of so many treats to bake but first I want to start out with these biscuits! Yum! Thanks Pamela. If you do make these, would love to hear how you got on. They are so pretty Choclette, who could resist? Thanks for entering them into Bookmarked recipes, the roundup is now up. Christmas and Shortbread go together so well. Short and sweet, just how I like my biscuits. Hot stuff.